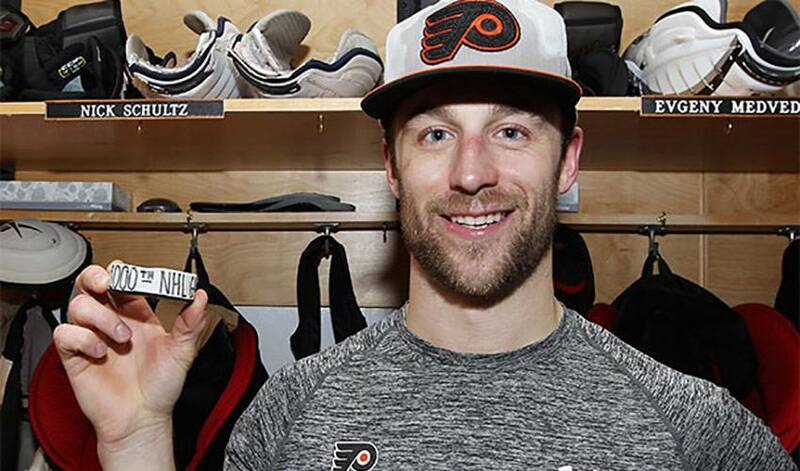 Nick Schultz has 1,000 reasons (and counting) to celebrate his enduring NHL career. There is, however, one thing of note he’s eager to add to his list of accomplishments. He couldn’t have scripted his milestone moment any better: family and friends in the stands, a home win against a longtime rival (Boston), a video tribute with his family standing by his side at centre ice, and entry into the 1,000 games played club. Schultz, the pride of Strasbourg, Saskatchewan, played his first NHL game on October 14, 2001. His future wife, Jessica, was on-hand to see it. He netted his first goal on November 29, 2001 playing for the Minnesota Wild. His father was there to see it. Fast forward some 15-plus years later and Schultz, now 33, is patrolling the blue line for the Philadelphia Flyers, a shot-blocking specialist respected for his veteran presence and team-tireless work ethic. Mitchell posted an Instagram photo to acknowledge his fellow defencemen’s milestone, a picture of them celebrating after winning gold with Team Canada at the 2004 World Championships. A list that also includes a pair of siblings. Now, all Schultz wants is to net the ultimate team goal. Carter Hart turned the page on the month of January carrying a six-game winning streak while helping the Phildalphia Flyers to a perfect 4-0-0 week. Hate to disappoint you, but Claude Giroux's favourite cheat meal is not a grilled cheese sandwich. In keeping with the spirit of the season, specifically, ‘‘Tis better to give than to receive,’ we can’t pass up featuring the Top 5 assists leaders so far in 2017-18.